…but this is what happens when I’ve been drinking and watching the Food Network. More experiments. 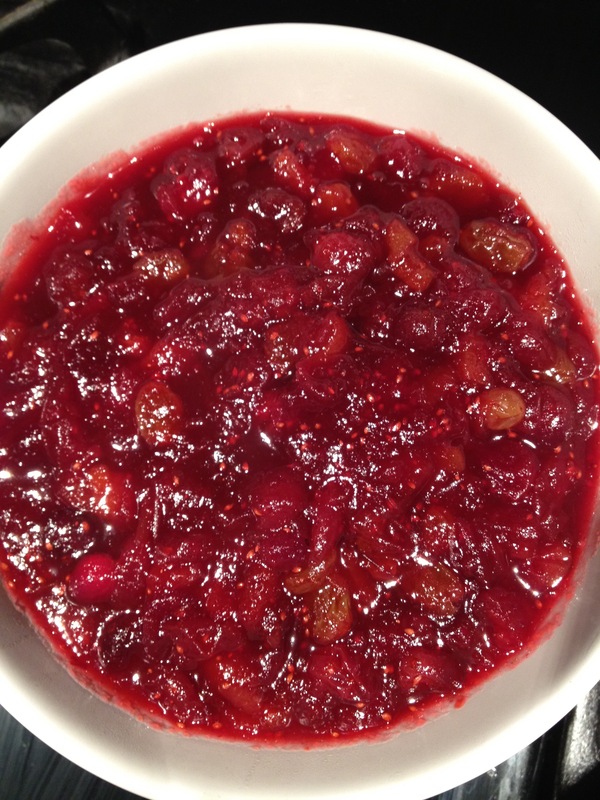 This time – Cranberry Sauce. My boyfriend and I had just returned home from an impromptu dinner at The Vanderbilt: grilled escarole, pumpkin salad, the “Bird Dog” (a hot dog made with pate and/or foie gras), and the pork meatballs, which were under-sauced but still amazing. We started the meal with a cocktail each, then switched to wine. I hardly drink anymore, so when I do I get giddy pretty quickly. Giddy enough to order us pumpkin spice donuts with cream cheese icing for dessert. So we got home, settled in, and turned on “The Best Thing I Ever Ate”. ‘Tis the season for Thanksgiving specials! Each of the chefs, from Cora to Fieri to Irvine to that obnoxious Guarnaschelli, were talking about turkey and stuffing and cranberry sauce. I hate turkey. I know it’s un-American, but it’s a dry and boring meat, and the only way to make it tasty is to slather it with gravy, a pile of tasty vegetables, or cranberry sauce. Cranberry sauce. I had cranberries in the freezer. I had Grand Marnier in the cabinet. I had just bought a giant bottle of honey at Costco. Was there an orange handy? Perhaps some dried fruit? I headed to the kitchen and went to work. 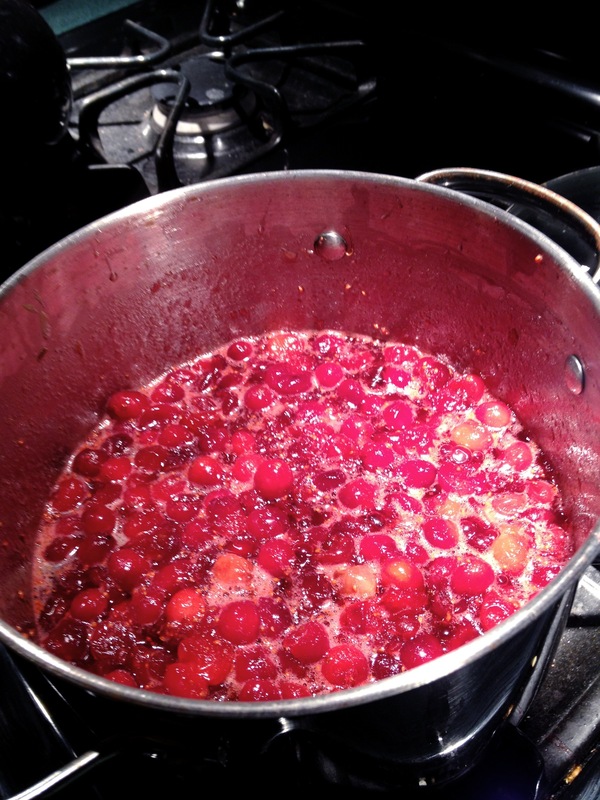 Bring everything to a boil, and keep it at a boil until several of the cranberries have popped. (Note to self and readers: This is an instance when you want to be wearing an apron or an old t-shirt, and not your brand new hoodie!). Reduce heat to low, cover and simmer for 15 minutes. Remove from heat. You’ll notice the sauce has thickened since it boiled, but it’s not gelatinous just yet. It will be – just let it rest. Cooking it more will only turn it into scary red viscous ooze, and that’s not magic. That’s a waste of perfectly good cranberries. I give you magic in a bowl. Enjoy on bread & butter, with yogurt, on its own, or atop a pile of dry turkey. This entry was posted in Recipes and tagged booze, cranberries, cranberry, dried fruit, holidays, liquor, sauce, thanksgiving. Bookmark the permalink.